"And today we have naming of parts..."
Is it pretentious to have specific names for certain areas in the garden? 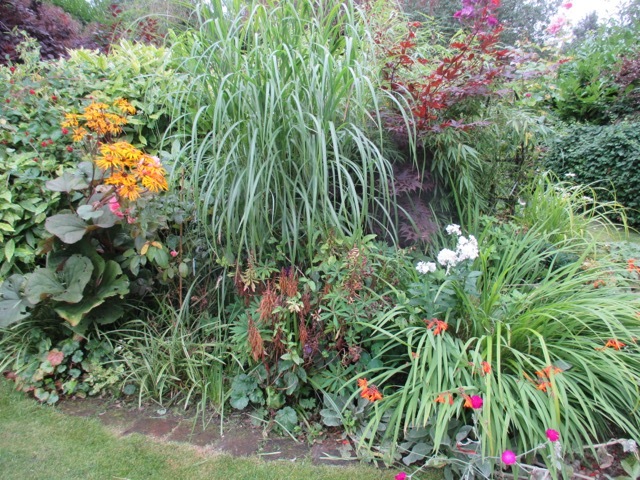 Is it a wee bit puffed up to have a 'Long Border' or a 'Rose Garden', or is it just the most sensible way to go ? 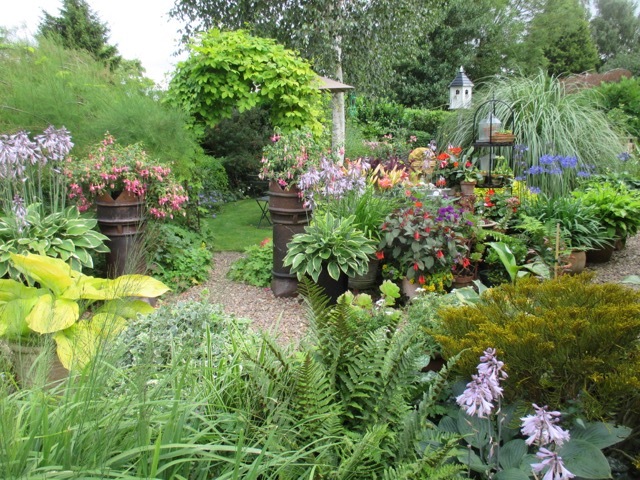 Monty Don has the 'Jewel garden' and the 'Writing garden' which, if I am honest, always make me feel a bit hot and cringy, when he mentions them. I guess you must be a bit pleased with yourself to choose names like those. The whole thing would have totally different connotations if he spoke about the 'Washing Line' garden, or the 'Weedy Border'. As we all have language, ergo, we all have names for everything and everybody. Life would be hard, indeed, if you referred to family members as 'You - with - the - curly - hair - standing - by - the - fridge', instead of by their given names. Names may be originally derived from physical characteristics, or by ancestry, as in 'Jackson' (son of Jack), but however they are derived, we need them as linguistic shorthand, as an easy way to reference people. There are some fantastic road names around the country, which have obviously derived from factual descriptions - 'Feather Bed Lane', 'Dog Kennel Lane' and 'Hat Case Lane' being true examples of the case in point. We need a succinct way of referencing the people, places and things in our life. So, "You know the road I mean, the one which goes past the church" becomes 'Church Street" over time. 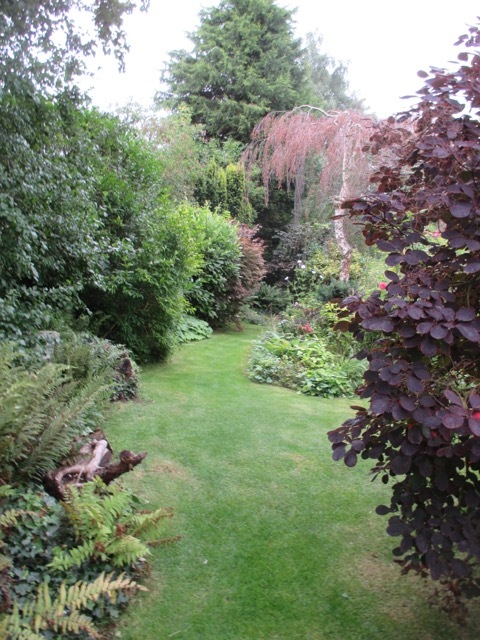 The Exotic Gardener and I do have names for the areas in our garden, just to make life simpler, so instead of having to say "The island bed beyond the gate but before the pond" we know what we mean when we refer to the 'Silver Birch bed', as it has, you guessed it, a weeping birch centre stage. Incidentally, this lovely tree has now been officially classed as dead, and is due to be cut down and logged any day. I have a sneaking suspicion that we will still be referring to the 'Silver Birch bed' though, for many years to come. So, I'll come clean, and name the parts of our garden, and leave you to be the judge! Pretentious ? Moi ? Or just plain sensible? 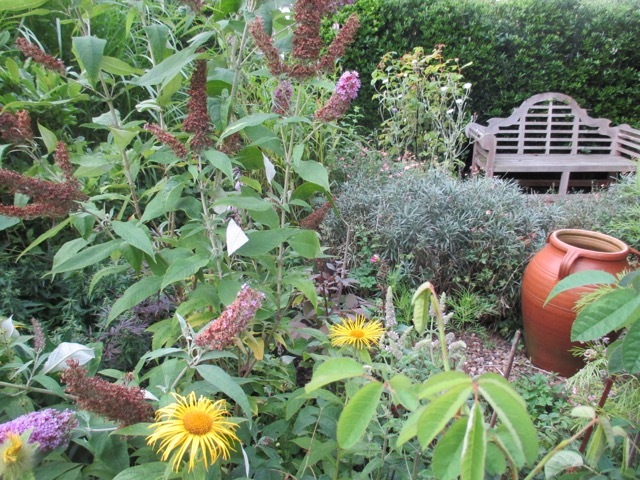 'The Dog Garden' aka 'the - enclosed - area - near - the - house - where - most - of - the - pots - and - planters - are'. 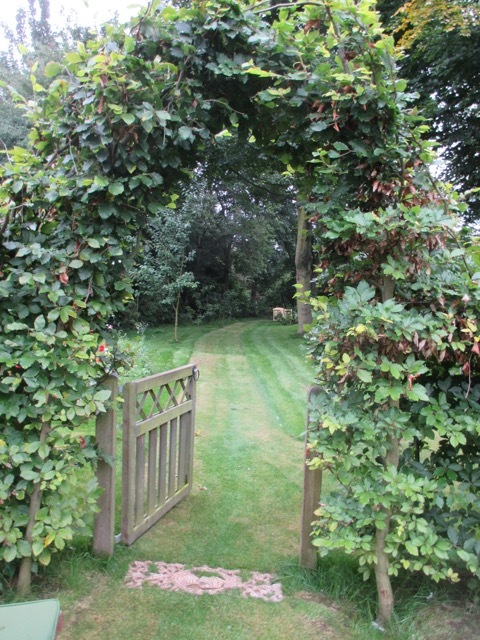 It is defined by a fence and gates to keep the dogs enclosed and contains the greenhouses, dovecote, and various outbuildings. Go through the gate and there is a series of named bits, namely 'Helen's Garden' (made and named for a dear friend who died three years ago); the Silver Birch bed; the Cotinus bed (self explanatory) and the 'Greenhouse bed' (still so - called, even though the greenhouse itself is lost in the mists of time). 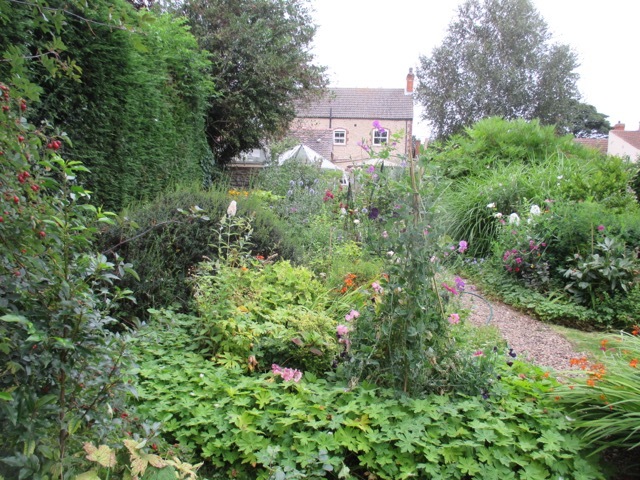 Then there is 'Top pond' ( as opposed to 'Bottom Pond'), before an arch leads through to the 'Bus shelter' garden (so named after a seat, also no longer here, which did bear a striking resemblance to the real thing!). 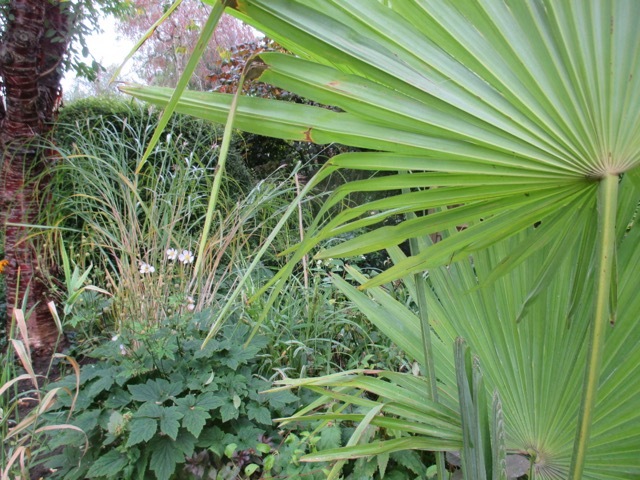 This is the part of the garden which is taking up much of our time and thoughts at the moment, as we are giving it a major overhaul and changing the feel of it completely. It has never really had a defined style, and has several half-hearted manifestations over the years. 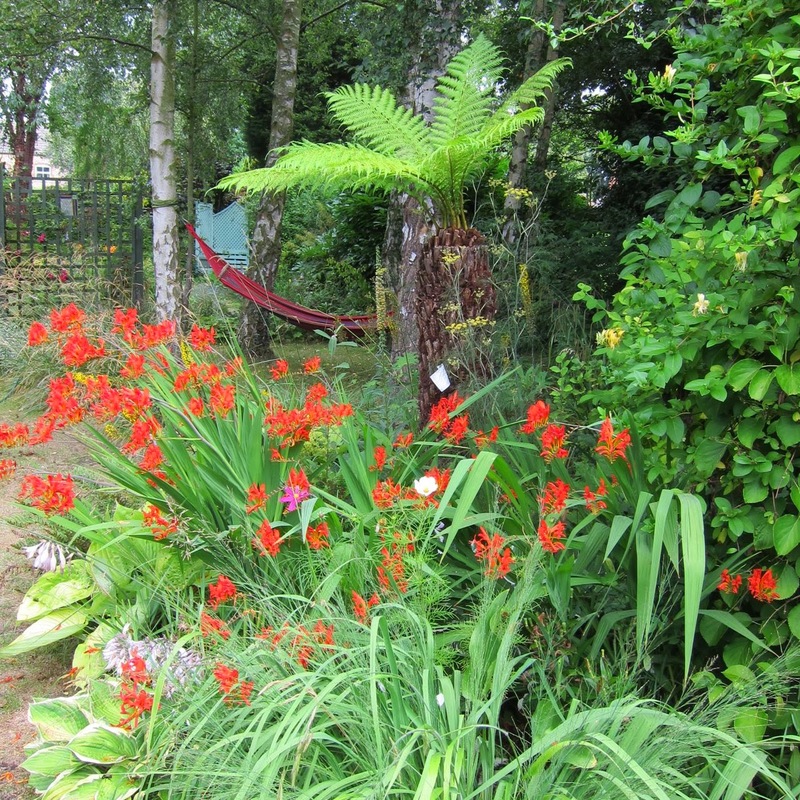 A few weeks ago we decided to extend the sub tropical garden into this area, and give it a makeover. 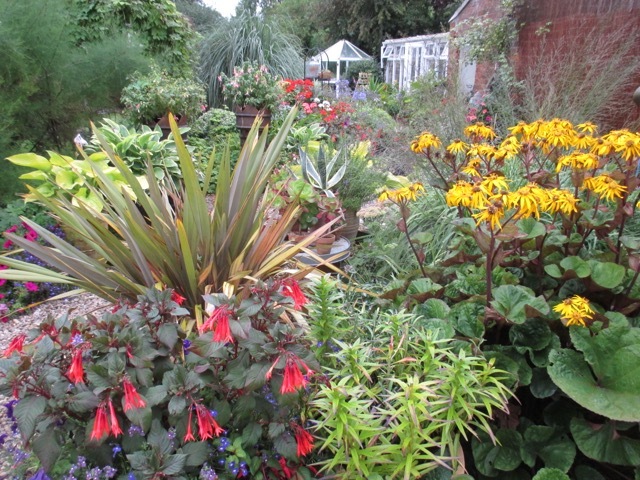 Plants have come out to make room for hardy exotics to go in. It has involved lots of hard work and digging , but the hard work is now completed. Now, as the 'Bus Shelter' is no more, and that part of the garden has re-invented itself, I think we need a new name for it. Something a bit self-deprecating, may be a bit amusing and something which rolls off the tongue. Any ideas will be more than welcome ! We have started referring to it as the 'Sub Trop', but we can do better than that! 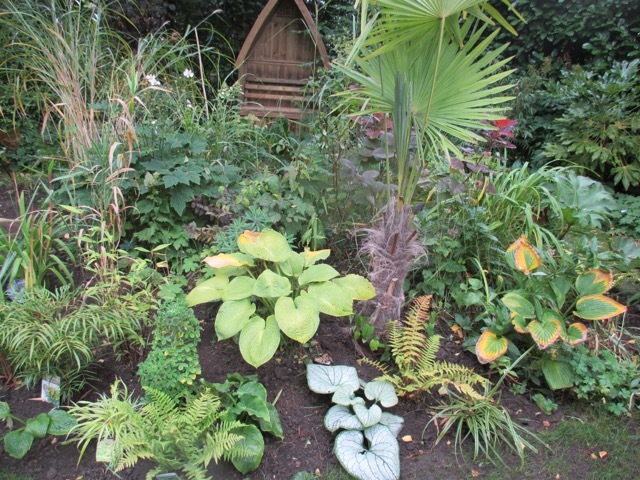 Moving on down the garden we have the 'Summer House garden' (the sub tropical/ hardy exotic bit, in the midst of which really IS a summerhouse! 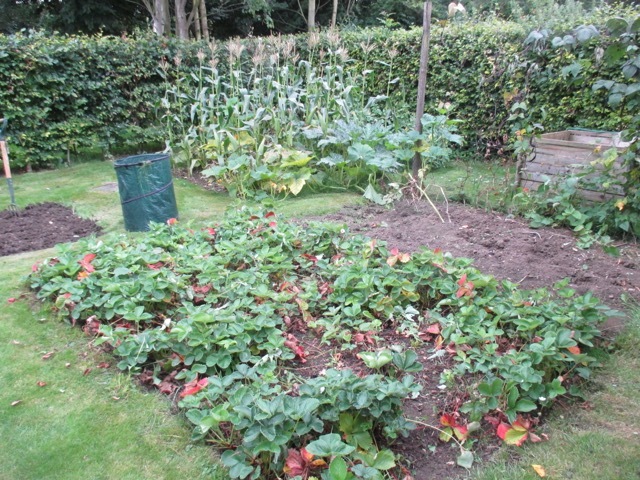 ), veg plot (does what it says on the tin!) , 'orchard' ( ha ha ha ! 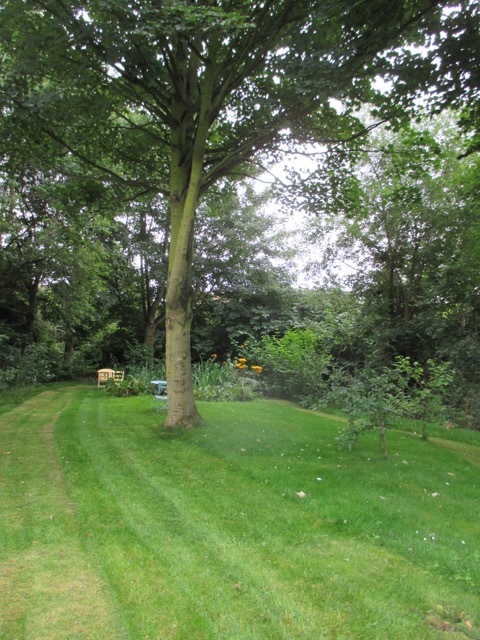 Do three spindly fruit trees constitute an orchard? That one IS a bit pretentious!) 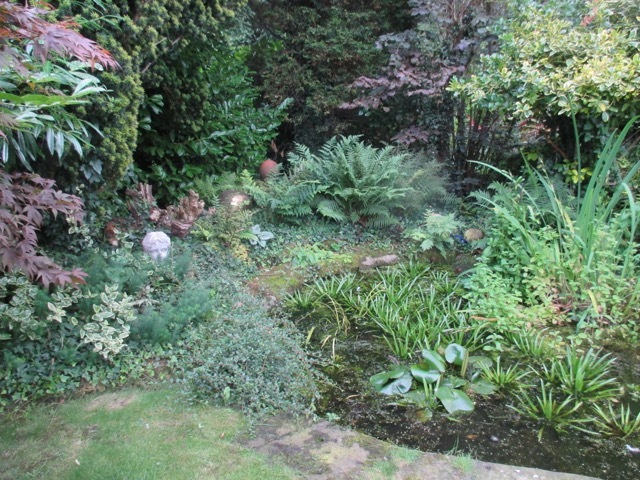 and 'Bottom Pond'. Most of our names are a bit like 'Church Street' - just shorthand references to physical markers which identify a particular area. they are very pragmatic and down to earth. 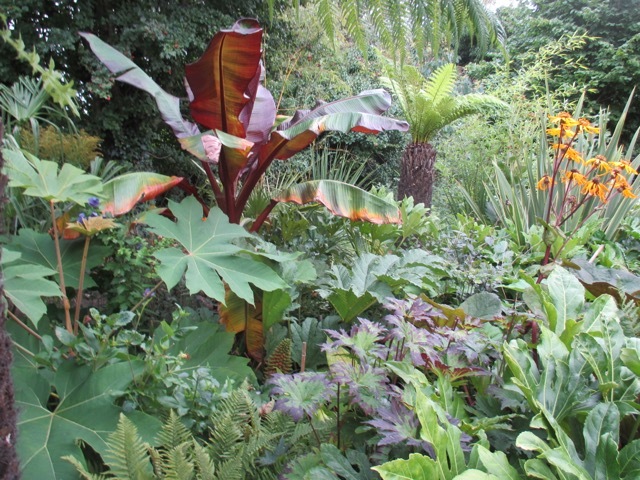 No'Jewel Garden' or 'Writing Garden' here! Perhaps we should rename them the 'Sciatica Garden', the 'Dandelion Garden', 'Dove Pooh Path' and 'Border of a Thousand Curses'? Go on then, I've come clean and shared ! 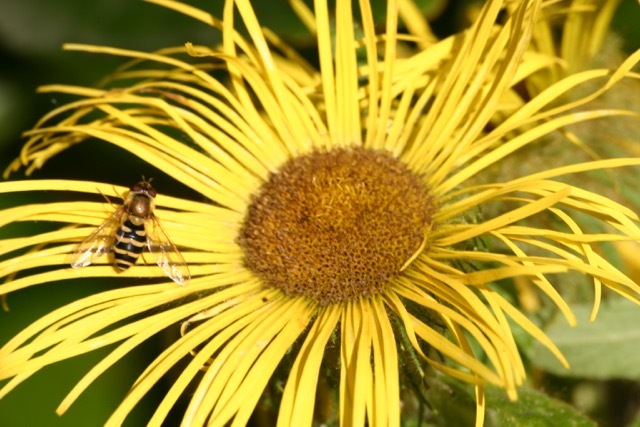 What names do you have for the different areas of your garden ? 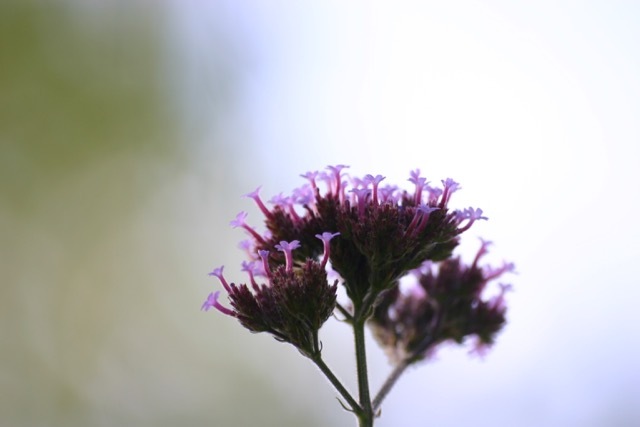 Above is Verbena Bonariensis against the light. 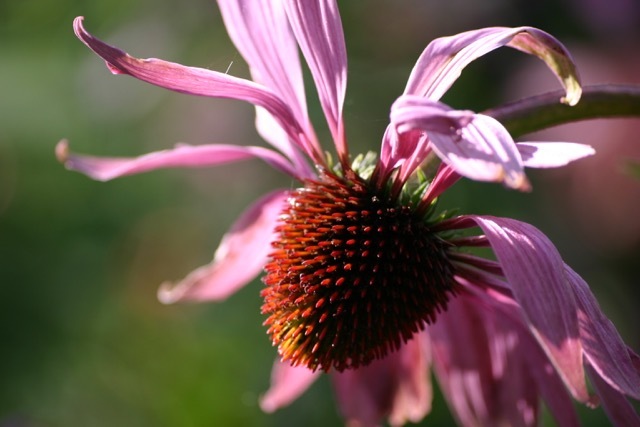 This is the tall variety although I am also growing 'Lollipop' which is about half as tall, and a very useful plant, as it sits so well in the borders. 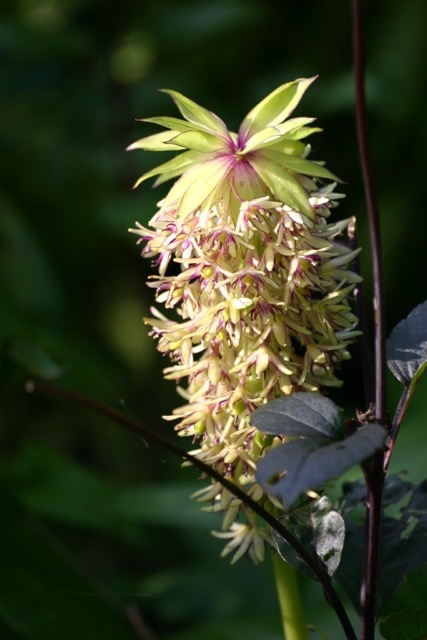 I have grown Eucomis Bicolour for many years and have always wondered why it is so called. The photo above answers my question, and I don't know, now, how I missed those purple tips which contrast so well with the white ! 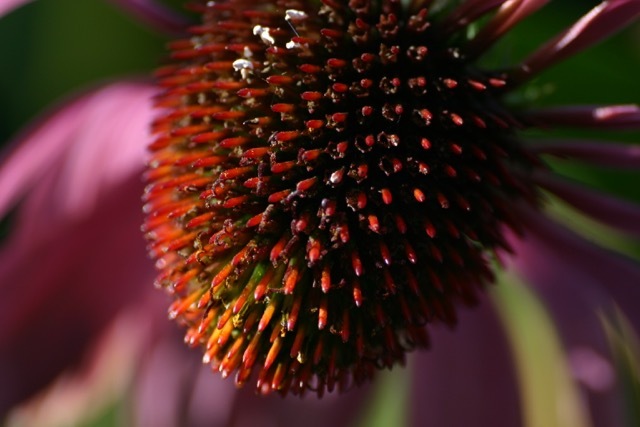 Using a Macro lens really makes you look closely, and sometimes look anew. 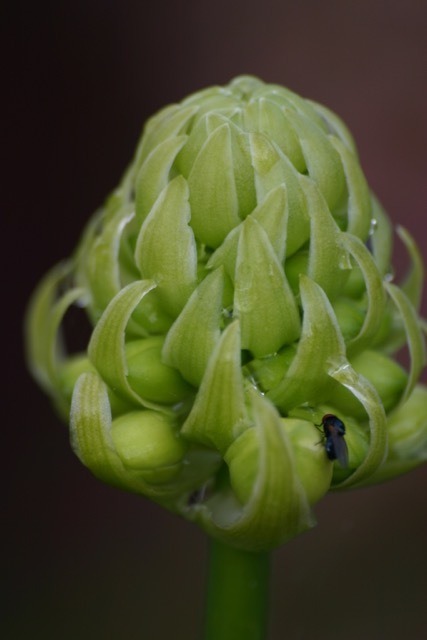 I have found Eucomis Bicolour to be extremely hardy, and it weathered the freezing cold winter of 2009/10 outside in the garden, with no protection. 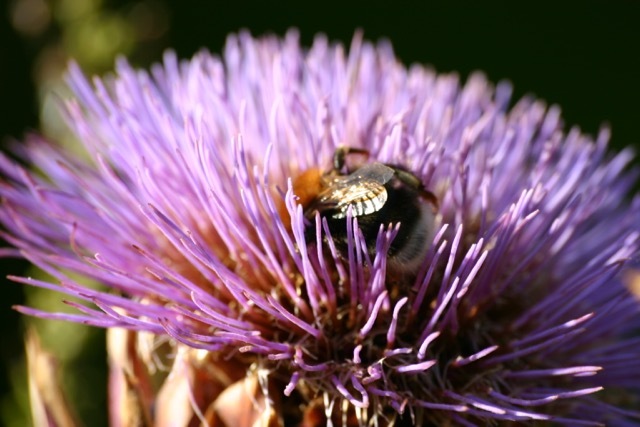 These two photos are of a Cardoon - a tall and stately bee magnet. Above is Digitalis Illumination 'Raspberry', which has been blooming for months. 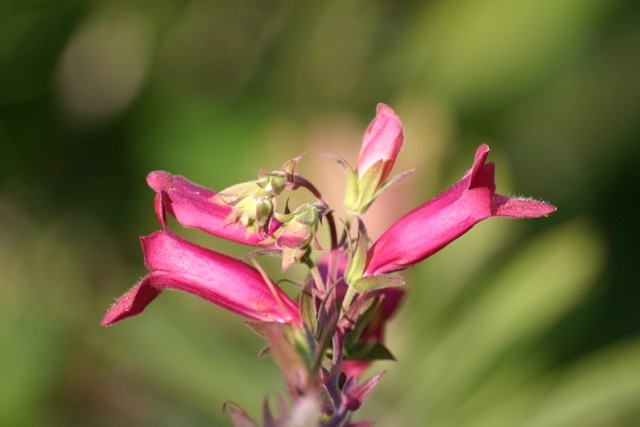 I intend to dig it up and overwinter it in the greenhouse, as one of its parents is the Canary island foxglove, which is tender. 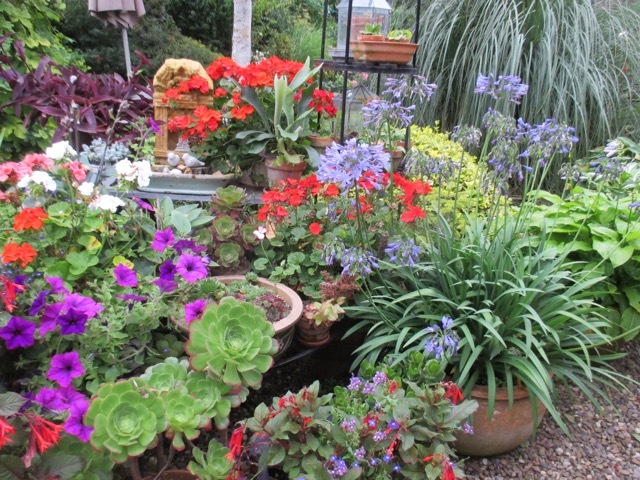 I left plants in the ground last winter, and, yes, of course, I lost them all ! Erm, it's a bulb, it's late flowering, it might be white ... and I haven't a clue what it is! Suggestions please ? 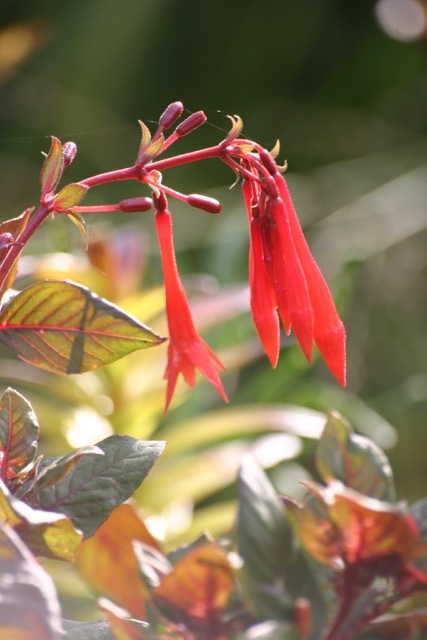 Above is a Fuchsia, overwintered in the conservatory, so, although it was late into flower, it is a large and healthy plant. Is there a better blue anywhere ? 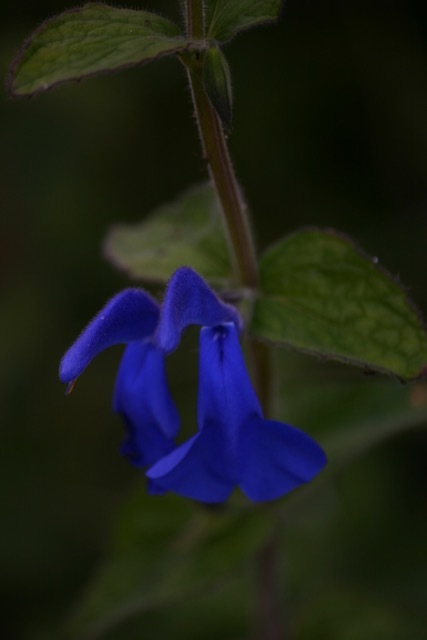 Salvia Patens, grown from seed this year. They were easy to grow, but the germination rate was very poor at about 20%. 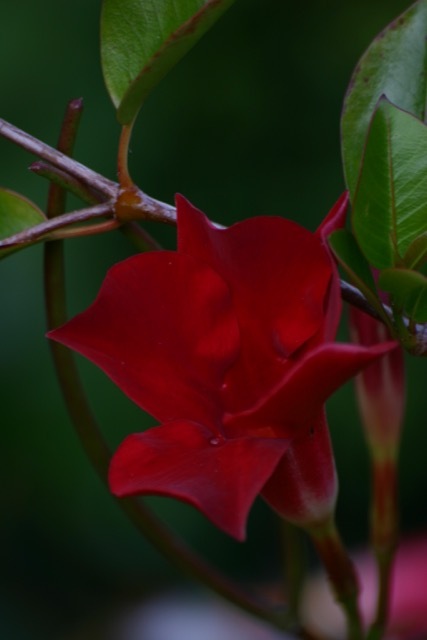 The scarlet Mandevilla, which has flowered constantly since spring, and been absolutely covered in sweet blooms. 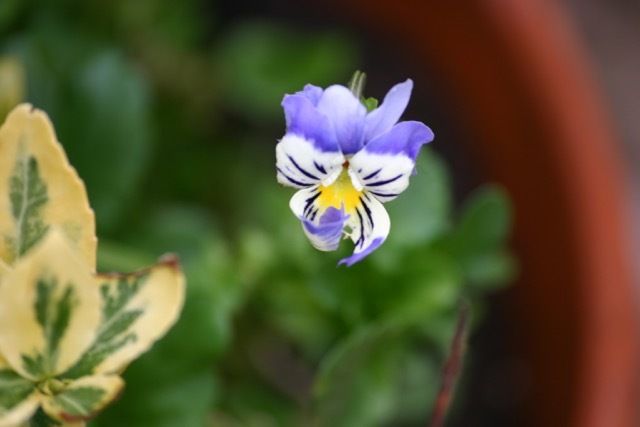 It is tender, but overwintered well in the frost-free conservatory, and still had blooms on it at Christmas. The rose-without-a-name because I lost the label ! Again, suggestions are most welcome. 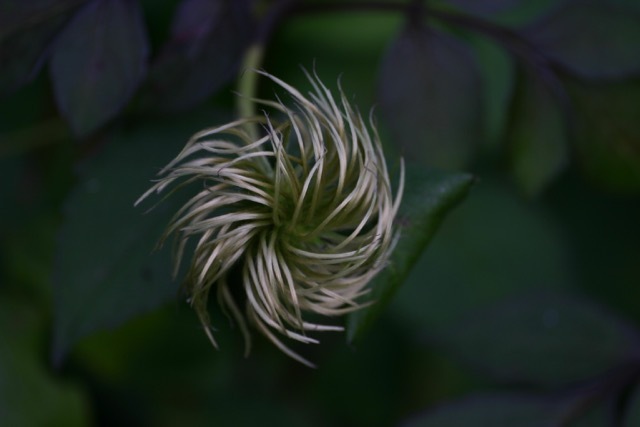 This dahlia is ancient and has never been lifted, just grown larger and larger over the years, and , ridiculously, I think it has got darker! 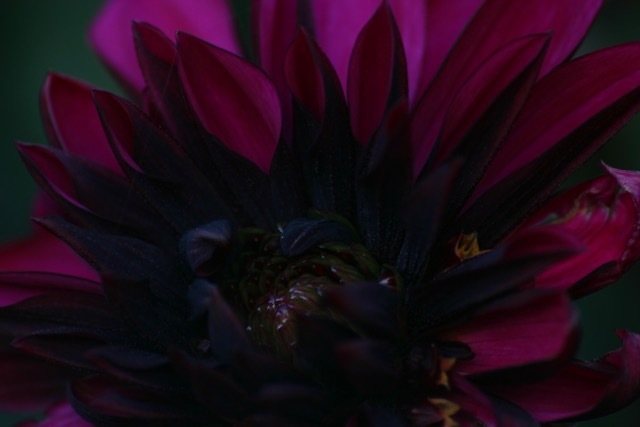 I really can't remember those nearly black flower centres before, but they contrast very well with the purple petals. 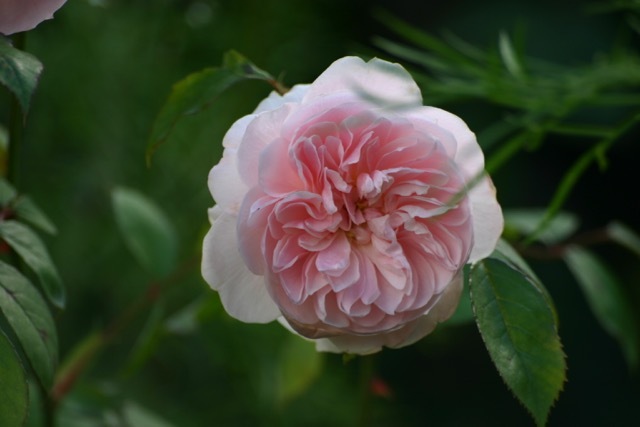 Many of the roses are blooming as strongly as they did in June, and this 'Wisley' is no exception. 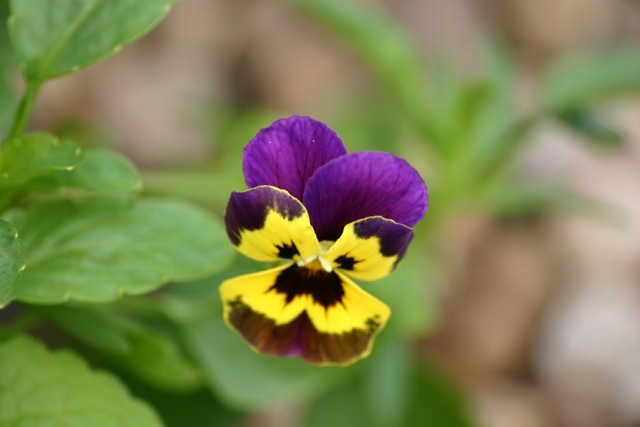 If Viola's were difficult to grow, and thus, expensive to buy, I think that they would be revered by gardeners, and plants would change hands with the same enthusiasm, and expenditure, as the tulip bulbs in Holland in 17th century. Because they are cheap to buy, plentiful and easy to propagate we tend to take them for granted, rather than appreciate their true beauty. 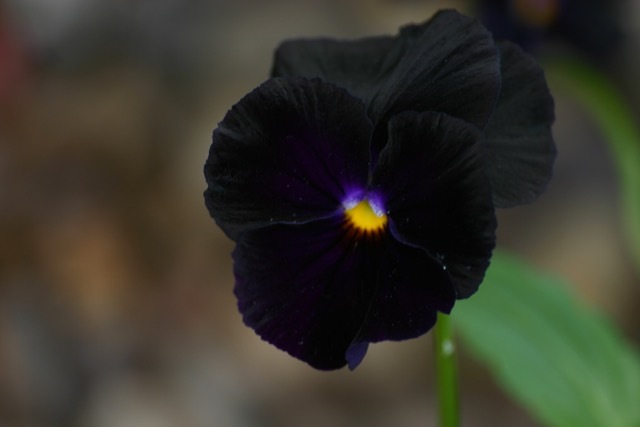 Viola 'Bowles Black' is truly black, a rich glorious black, lightening to a rich, deep purple at the edges and centre, contrasting strongly with the sun-like eye. 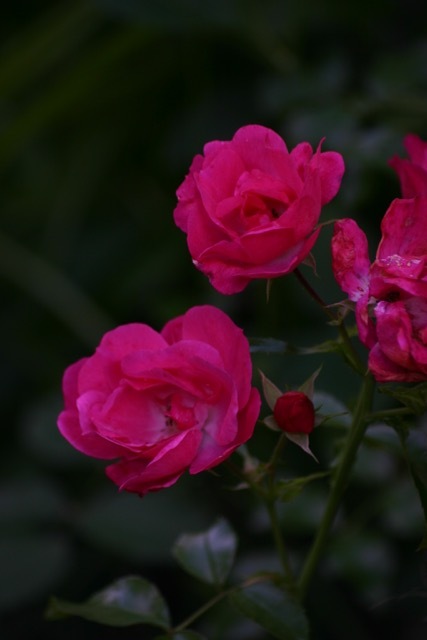 The petals are very tactile as they are deeply ridged, with a velvet - like sheen. 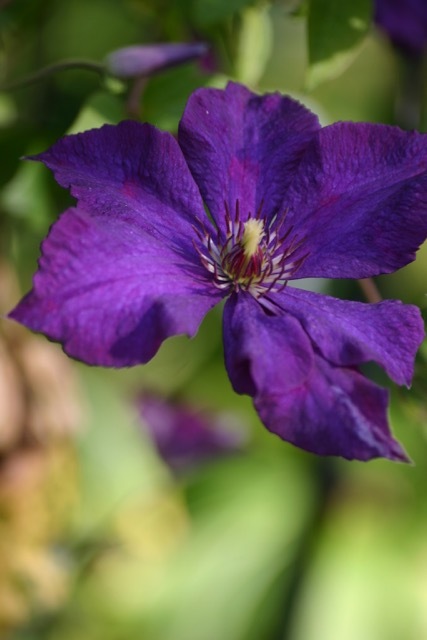 They are so easy to grow, and will flower only a few weeks after sowing. Seed is sown thinly in a seed tray and covered with compost, as they germinate better in darkness. The tray should be kept watered but not too moist. 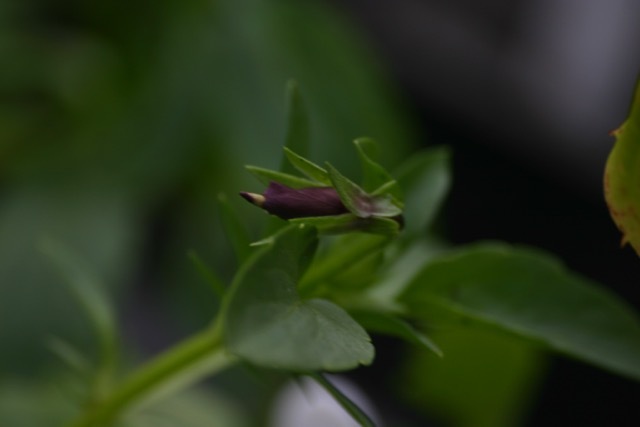 Seeds germinate after 10 to 20 days, and seedlings can be pricked out when they have their first set of true leaves. 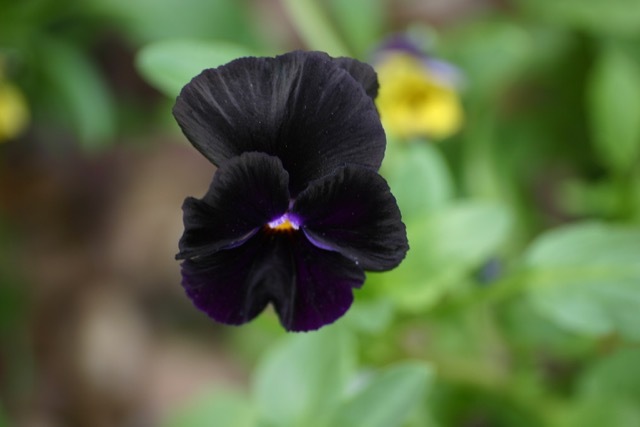 As well as 'Bowles Black' I also sowed a packet of Viola 'Bambini', a variety which I have never grown before, but am really enjoying. 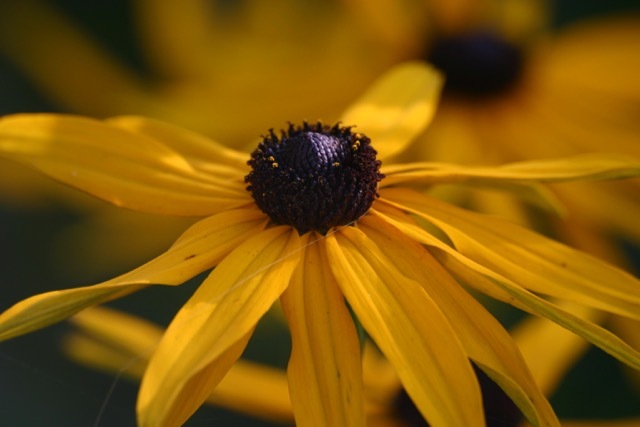 'Bambini' is a mix of colours including yellow, maroon, purple, yellow, cream and mauve. 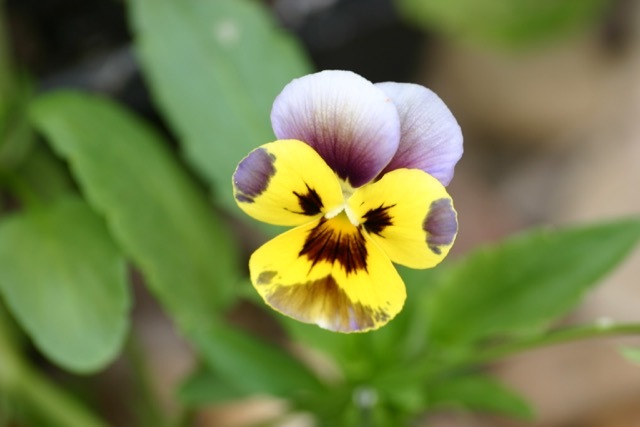 All the flowers I have seen so far have all been bi-colours with fantastic 'whiskers', and faces, making them very distinctive. 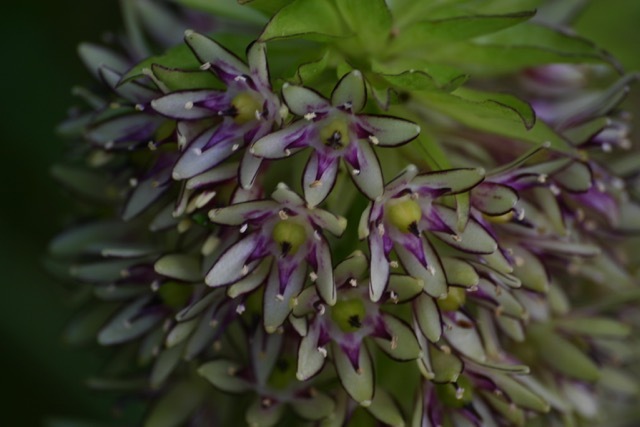 Flowers are small, as the name suggests, but as there is a profusion of blooms on each plant, then individual flower size becomes less important. 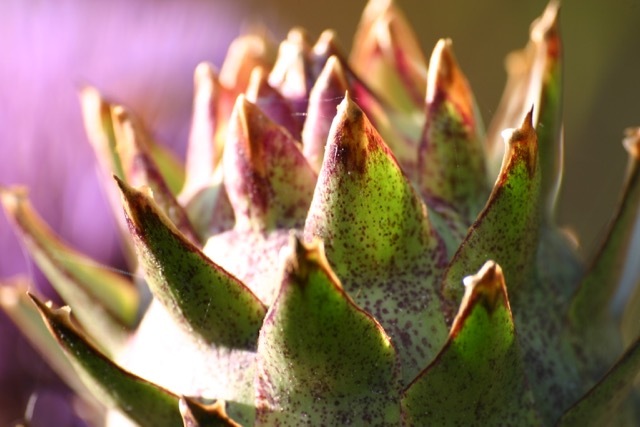 Growing from seed has got to be the cheapest way to generate large numbers of new plants, but this can be frustrating with some plants, if their seed is difficult to germinate. 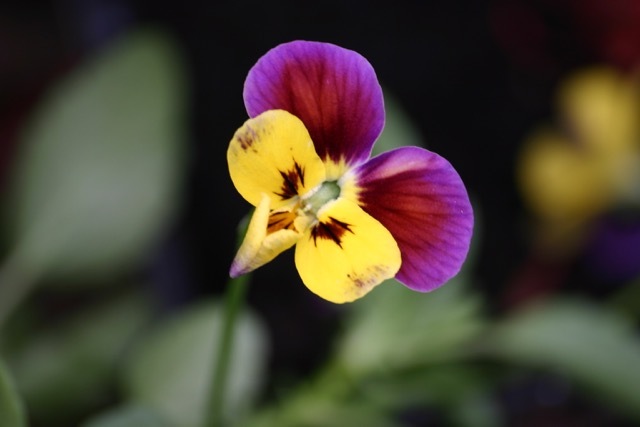 Not the case with Violas as they germinate quickly, with a good success rate. 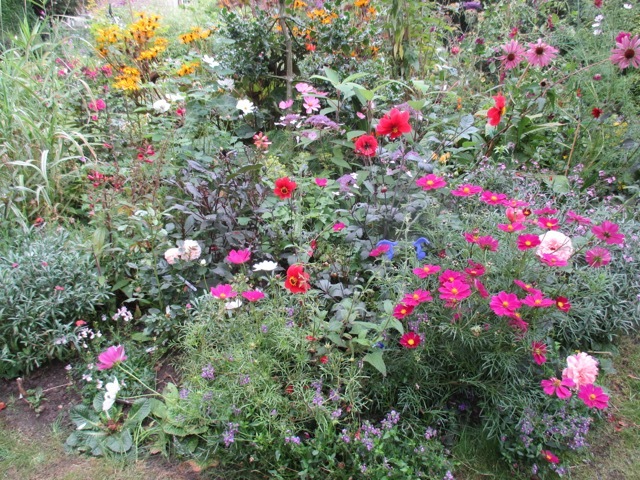 I grew my seeds in the greenhouse and sowed them in July. They germinated quickly in the heat and have grown on well. I have been hardening them off over the past few days, to prepare them for being planted out once the summer bedding goes over. Seedlings and young plants are robust and healthy. 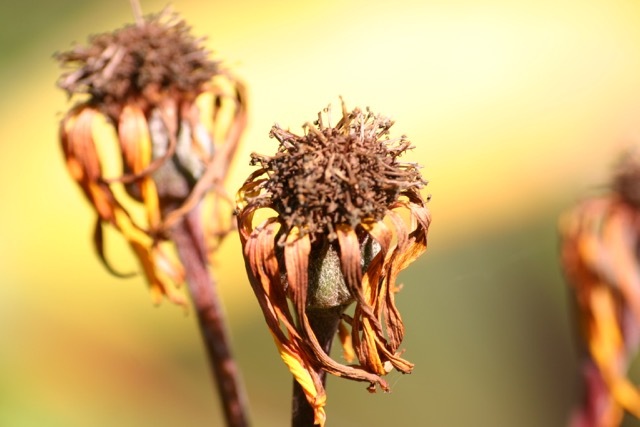 They can cope with a certain degree of neglect and bounce back - a couple of days without water won't kill them off! They seem to remain healthy and free from pest damage. 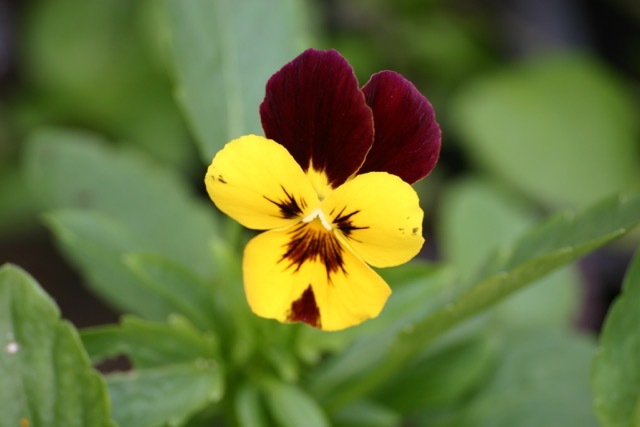 Violas are said to be better at flowering in cold weather than pansies, due to their Alpine roots, and this is something I will be watching out for over the coming winter. 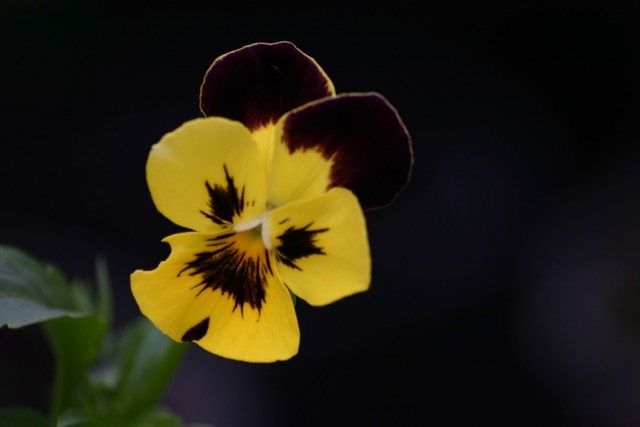 Violas and pansies follow the sun, and will turn their faces towards it. This is something to take into account when siting them, as , if they are wrongly positioned, then the backs of their heads will be the only thing on view! 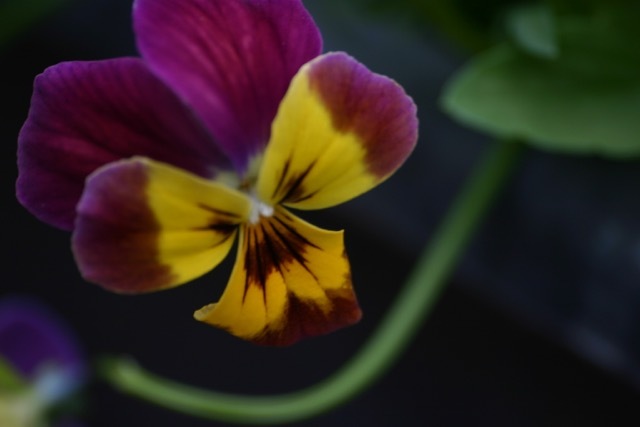 The Viola in the photo above looks very vintage, with those subtle washed out colours, and lovely little blotches! The flower above is, I believe a rogue, and not a 'Bambini'. It looks like a miniature version of Thompson & Morgan's 'Halo' which I grew last year. The markings are so beautiful and delicate that the parentage becomes inconsequential! The bloom in the photo above looks quite Clarice Cliff - very deco in colour and facial pattern. there is something very old fashioned and nostalgic about it. I intend to grow more and more of these lovely flowers in the years to come, and try lots of different varieties, as I do love them. 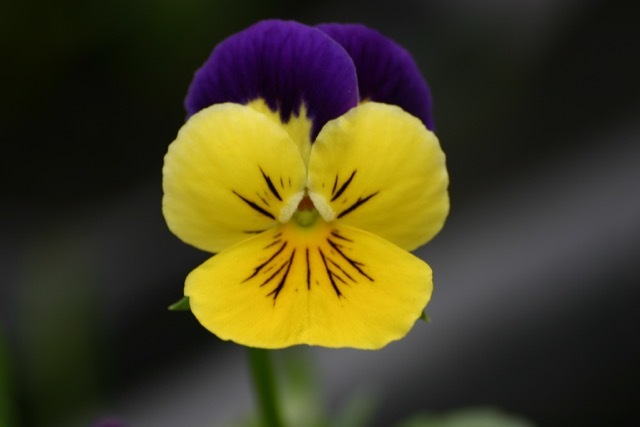 There is, however, a real down side to Violas in that my fantail doves love them even more than I do, so I may just be left with a few pecked stalks !